Everyone in Takamo knows what is meant by the term “Habitat Range”. In Takamo Universe, habitat range will have a similar meaning but in a new context. Habitat range will now consist of a single number instead of an atmosphere and hydrographic pair of numbers. Each star system will have a habitability or “Goldilocks” zone comprising one or two planet orbits around the star. The Goldilocks zone will vary depending on the size and type of star in the system. Smaller, cooler stars will have Goldilocks zones in the closer orbits while hot stars will have zones in farther orbits. Planets in the Goldilocks zones will be classified as “habitable” worlds and will be the equivalent of “terraformed” worlds in the original game. Planets outside the Goldilocks zone will be the equivalent of unterrformed worlds. These “unterraformed” worlds can still be colonized, mined and occupied as in the old game. Habitat ranges for each empire will refer to a +/- 1 range on the planet in the Goldilocks zone. However, all empires can live on a habitable planet. If the world happens to be in the +/- 1 habitat range of the empire, the world will have additional benefits for the empire. For example, a planet in the Goldilocks zone that has a habitat value of 5 would be most useful to an empire with a habitat range of 4, 5 or 6. Empires with ranges of 1to 3 or 7 to 9 could still live on the planet but at a reduced efficiency. What will this mean for player empires in the new game? Players will be able to estimate the possibility of useful worlds by the class of star they detect in the system. This will aid them in determining whether a particular star system is worth exploring. Additionally, it makes every habitable world accessible to every empire in the game which evens the playing field for all empires and makes those habitable worlds and star systems a more valuable commodity. 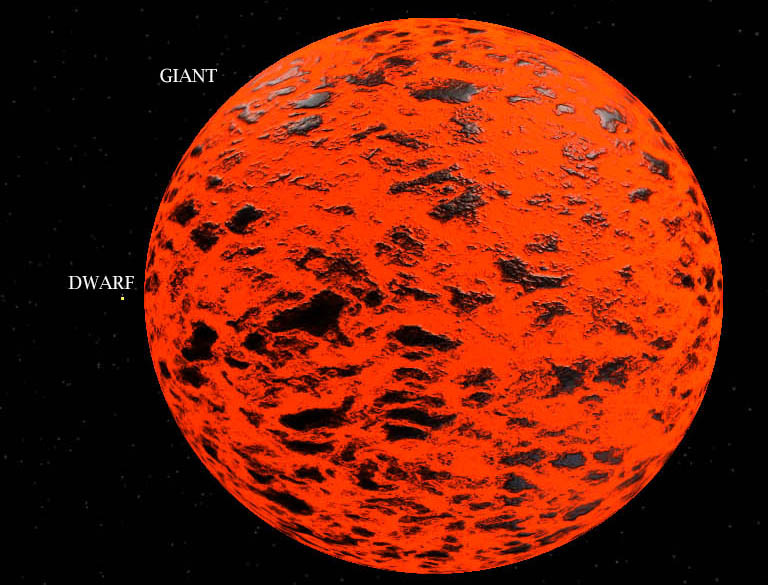 The illustration above compares a main sequence yellow dwarf star and an aging red giant.